When choosing a gift for young girls, you want something they’ll love and which has a personal touch. 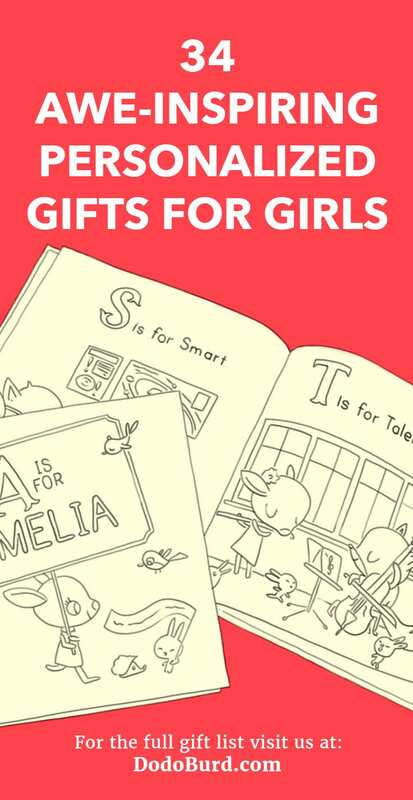 This list of personalized gifts for girls has some amazing present ideas which can all have their names added, which will let them know that you thought about them even more when choosing their gifts. Girls should be taught how to feel confident in themselves from a young age. This personalized book is perfect for doing just that; it’s filled with an A-Z of positive traits with accompanying illustrations, so whenever she feels down, she can look at this and remind herself of why she’s awesome. This adorable cushion would make a great decoration for your daughter’s room, especially if she loves reading. You’re able to customize it with her name and adjective, along with a drawing of her, plus a “review” from you on the back (it’s really just a doting message). If your little girl is at the age where she wants to go for sleepovers at her friends’ houses or even to visit Grandma, she needs her own duffel bag with matching cosmetics case. This gorgeous one is embroided with a beautiful butterfly and you can add her name so she won’t lose her items. Empowering your children is essential for them to grow up and become confident adults. Personalize this book and show her that she can change the world on her own, just by being herself, and remind her that a little bit of kindness goes a long way. Reading your children bedtime stories can be the most enjoyable part of the day, and it helps them to wind down enough to get a good night’s sleep. With this named book, you’ll be able to send them off to sleep so they’ll wake up the next morning refreshed and ready to enjoy the day. Not only will this book teach them how to recognize their name and spell it, but there’s also an animal encyclopaedia at the end, so they’ll be able to learn all the different animals in the book which helped gather the letters needed to spell her special name. Hang this growth chart in her room and you’ll be able to track her height as she grows up. Decorated in beautiful pastel flowers and butterflies, you’ll also be able to keep this as a keepsake to show her when she’s older so she can see how little she once was. Your daughter has seen you with your purse and probably wants one of her own. When you need to buy personalized gifts for girls, this Melissa and Doug purse with matching accessories such as keys, mobile phone, and a purse with coins inside, means your daughter can be just like her mommy. As your daughter grows up, she’ll need to complete more and more homework to keep up with her studies at school. Give her this personalised lap desk, which is available in four different colors, so she’ll always have somewhere to work, away from the chaos of family life. This is such a simple piece of art but it looks so effective. Perfect to hang in a new nursery, you can personalize it with your new baby’s name and birth date to show them that you’ll always love them to the moon and back. Perfect for adding to their existing art collection, these princess stamps will add a new dimension to their artwork. You can also add their name to the storage box, so not only will their stamps be kept together and safe but there won’t be any mistaking who they belong to. You’ll be able to use this personalized plate to encourage your child to eat their meals, because we all know how fussy kids can be. They’ll love clearing their plate to reveal their brightly colored name which has been printed in the middle, and no one else will ever mix it up with their own. When your child starts school, you want to make sure that everything you’ve bought them is correctly labelled so nothing goes missing. With this custom water bottle, you won’t have to label it as her name will already be printed across it, clearly showing whose bottle it is. Coloring in is great for children as it encourages spatial awareness as they color inside the lines, and it’s also great for helping them to calm down. This princess themed book isn’t just filled with unicorns and castles, it’s also been customized with your daughter’s name so she’ll be even more interested in it. If you want to buy personalized gifts for girls you know, it doesn’t get more personal than a bobblehead doll which looks exactly like them. Made from a photo you send, you can even choose the clothing so it’ll look just like the little girl you’re buying for. Perfect to go in their dressing up box, you can personalize this superhero cape with your child’s name in a number of different colors. You can also choose the cape design itself; from unicorns to sharks, there’s bound to be something in here which your child loves. You can choose from ten different box contents for your custom gift box, all of which contain different items and can even be chosen depending on gender. As well as receiving items like bubble scoops and goat milk soap, your kid will also get some slime which is proving to be very popular at the moment. Wherever you look at the moment, there are unicorns. They’re on absolutely everything and they’re proving to be firm favorites with our daughters. Get her this personalized unicorn necklace which has her name and birthstone on which will make her feel as magical as the mystical beasts do. Customize this beautiful print to reflect your child and you’ll have some wonderful artwork to display on the walls of their room. With this picture, you’ll be able to turn them into a legend forever as if they were featured within the pages of a real story book. A beautiful gift to give to a young girl, this personalized unicorn plate will definitely make mealtimes easier. Pretty in pink with a magical rainbow unicorn print, you can add your daughter’s name across the top and she won’t be a fussy eater anymore. Getting your child to willingly have a bath or shower is tricky, it’s almost like they don’t want to become clean! However, this personalized bath mat should entice them into the water. It’s machine washable and super soft so it’s easy to clean and luxurious to step onto. Children are far more likely to eat something that they’ve helped to prepare – if they know what’s in a dish, they won’t think that you’re trying to get them to eat something they don’t like. With this personalized “Chef in Training” apron, you might set them on their culinary career path from a young age. Kids like to mark their territory, and with this rubber name stamp, they’ll be able to put their name on just about everything. Use it to sign off cards, claim books, or even in some of their artwork. Just make sure they keep it away from any furniture, or they’ll be claiming that, too! Give their bedroom a personal touch with this adorable pillowcase. They’ll be able to relax and drift off to Dreamland as soon as their head hits this 100% polyester pillow cover – there’ll be no mistaking whose bed is whose once these have been put on. If you travel a lot with your kids, or they just enjoy spending a weekend at Grandma’s, this roll along suitcase is perfect for them to put all of their clothes in. The beautiful flowers are really eye catching and her name can be embroided across the front in your choice of thread and font. Whether you choose to give this as a gift to welcome a new baby or as a birthday present, this personalized pillow will be well received. On the back, you can enter the baby’s birth information and on the front there’s an adorable animal who shares the same first letter as the child. When choosing personalized gifts for girls, you want to get her something which is going to make her feel good every time she looks at it, and this piece of artwork will do just that. Featuring a drawing of your child, they’ll always be reminded that they can be brave when they want to be. This is the perfect gift for any fan of unicorns and it’ll look so cute in their bedroom. As well as the adorable unicorn and rainbow print, you can also personalize it with her name in your choice of font which will make her love this cushion even more. Everyone loves a bowl of ice cream and it’s even better if it’s covered in sauce and toppings. Make your daughter feel extra special by serving hers in this customized ice cream bowl; she’ll love knowing that she won’t have to share whatever is inside! Children love making a mess but if you can channel that into them creating some kind of artwork, then your life will be a lot easier. They’ll need somewhere to keep their art supplies though, which is exactly what this personalized art caddy is for. Add a personal touch to somebody’s bed with this super soft printed pillowcase. There’s a print of a magical unicorn on the front as well as her name, and she can take this with her everywhere – on road trips or holidays – to mark her territory and make anywhere feel like home. Every girl remembers her favorite dolly, even when she’s old and gray. Get this one for your little princess and you have the option to add her name to the skirt so she’ll never get lost or mistaken for someone else’s. You’re also able to choose the hair color, making her the perfect ‘mini me’. She’ll be able to wear this cool name hairband wherever she goes, whether it’s to school or gym class – in fact, anytime she needs to keep her hair out of her face she’ll be able to, while also looking stylish, something which is of utmost importance to tweens. This is such a good idea if you don’t have a lot of money to spend on a present. Take yourself along to a dollar store and buy a load of art supplies which they can use to create amazing pictures. Personalize a bucket for them to keep them in and you have an amazing present. Have a go at making this personalized lap tray for your daughter and she’ll be able to use it for a number of things; mealtimes, doing her homework on, and even reading. Create it in colors and patterns you know she’ll love and she’ll never get bored with it. If you want to measure how big your child is getting, this DIY wooden growth chart is perfect. Instead of heading to the store to buy one, you can get stuck into a new project and create this distressed looking one in your own home for a fraction of the cost.